Jew from DC Nominated for an Oscar! Jews receiving accolades for their successes in the movie business is nothing new. Frankly, I’m thrilled to see Natalie Portman (“Black Swan”) and Jesse Eisenberg (“The Social Network”) up for best actor. But Debra Granik, director of best film-nominated “Winter’s Bone,” bears the local honor of having grown up in the Washington, DC area (Silver Spring and Bethesda, according to this). “Winter’s Bone” isn’t exactly the type of film you’d expect an urban Jew to make. 😛 Set in the Ozarks, a highly rural woods in Missouri, the story follows a teenage child as she tries to take care of her siblings and locate her wayward father in the wilderness. However, Granik does see some similarities between her own heritage and that of protagonist Ree—namely that they are both outsiders, and the young girl, like Granik’s great-grandmother from a Lithuanian shtetl, have to survive in a harsh world. Click here for a more detailed interview with this director. The Oscars are airing this Sunday on ABC at 8 pm EST, with James Franco, another tribesmember, hosting. In the meantime, check out this trailer of “Winter’s Bone” and happy movie viewing! Educational footnote: Although Jews in the Ozarks number likely few to none, the state of Missouri is home to a decent population- including my own mother, who was born in Kansas City. 😛 Click here for more info! First David Harzony, a Jewish philosophy scholar, publishes a book on the significance of the Ten Commandments in 21st century life, then Moment Magazine uses the Decalogue for it’s January/February 2011 issue (full disclosure—I helped to fact check this publication,) and now, on Thursday night, local Jewish thinkers sit down to discuss their thoughts as part of DCJCC’s Authors Out Loud series. 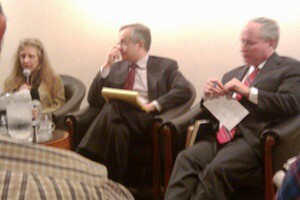 Among the diverse tribes-people who first discussed and debated their points before taking questions from the audience were Harzony, Nadine Epstein, editor of Moment; Bill Kristol, editor of The Weekly Standard; and Rabbi Gil Steinlauf of Adas Israel. William Daroff, Director of the Jewish Federations of North America’s Washington office, officiated. The setting was academically intimate, a rug laid out on the floor, plush chairs for the panelists and a table with water. Some of the points that were brought up included how important are The Ten Commandments in Torah? What would we feel about them if we read them without the prejudice of what they’ve come to represent over the course of history? 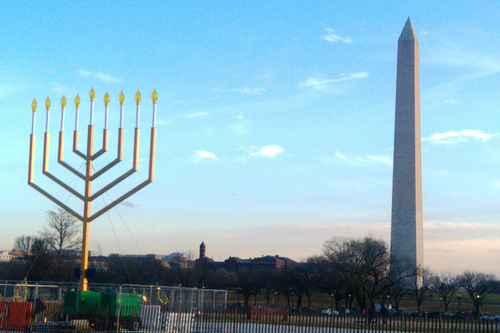 Are American Jews distancing ourselves from a basic tenant of our faith due to the influence of the Christian Right? What are the differences between Jewish and Christian interpretations of The Ten Commandments, and are they important? When 90% of Americans have strong opinions on the Commandments, yet only 40% can name all ten, what does that say about our discourse? Should in depth study of the Commandments be encouraged, even by secular Jews, in public schools, rather than just seeing the Decalogue as a political symbol? Are The Ten Commandments meant for everyone or are they meant just for Jews? I’ve listed these questions, and left out plenty more, mostly to prove that this is an issue without clear answers, which personally, if I were to write an eleventh commandment, might be it. 😛 I really appreciate the chance to look at The Ten Commandments as more than just a rallying point in the church vs state argument. To study them in a religious setting and to take them seriously as a part of my heritage might lead me to a different place regarding the public sphere. Can one believe in a text about moral absolutism while honoring the “relativist” theory that “my truth” may not be “your truth”? Or maybe I could look at something like Hinduism’s Ten Commitments (mentioned in a Moment interview) as another “translation” of “the greater good.” Already I can tell that this philosophizing will require a lot of quotation marks. 😛 But if this panel was all about addressing The Ten Commandments as a relevant document in the 21st century, I think we nailed it. For more on The Ten Commandments, check out MyJewishLearning.com here. And follow Harzony’s upcoming book events here! Sign up for a DCJCC Shabbat Cluster Before Feb. 10! Interested in meeting young professionals in an intimate, religious setting? DCJCC’s Shabbat Clusters, which twice a year assign cohorts together to meet for Shabbat, is closing spring registration this Thursday. Shabbat Clusters provides a way both to reach out to your peers and bring Judaism out of the synagogue or community center and into your own home. Clusters, usually based on location though accommodations can be made for friends, encourage participants to pass the torch from one another and host one Shabbat dinner a month in someone’s house or apartment. It’s a way of blending traditionalism with the modern day! DCJCC will email you with your assigned Cluster after you fill out the registration sheet with pertinent info like age, religious and location preferences. 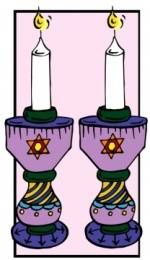 The first Shabbat experience will be on March 4.